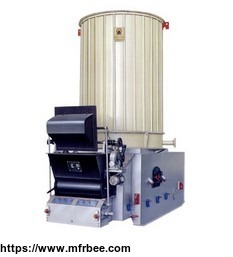 Commonly known as heat transfer oil boiler, the official name is hot oil boiler. It is a new type of heat energy equipment that uses coal, oil and gas as fuel and heat transfer oil as circulating medium. heat conduction oil furnace refers to a new type of heat energy conversion equipment that uses high-temperature heat transfer oil ( also called hot coal and heat carrier ) and usually uses \" MW\" ( MW ) to indicate the capacity of the furnace. Old units also use \" 10MW / hour\" or \" 10kcal / hour\", or \" 10kcal / h\". heat conduction oil furnace\'s advantage is \" high temperature and low pressure\" and stable and widely used. heat conduction oil furnace is mainly used for heating crude oil and natural gas and processing, storage and transportation of mineral oil in the use industry. Oil refineries use heat transfer oil to preheat cold materials and have been successfully used to heat solvent and extractant evaporation devices in the lubricating oil manufacturing process. Compared with heating with steam, heating with heat transfer oil has the advantages of uniform heating, simple operation, safety, environmental protection, energy saving, high temperature control precision, low operating pressure and so on, and has been widely used as a heat transfer medium in modern industrial production. In the chemical industry, it is mainly used for distillation, evaporation, polymerization, condensation / de - emulsification, esterification, drying, melting, dehydrogenation, forced heat preservation and heating of synthetic devices such as pesticides, intermediates, anti-aging agents, surfactants, spices, etc.